Fully illustrated and packed with interesting details that shed light on the vanished Gilded Age, Cigar Box Lithographs is a delight at every turn. Charles J. Humber’s Cigar Box Lithographs is a highly entertaining illustrated book whose charm extends well beyond the lithographs of the title. The book begins with a short introduction, placing the wooden cigar box in its time period—1880 to 1920—and cultural surroundings. It was a plush era when as many as eight out of ten American men smoked cigars. The front matter is succinct in explaining how the cigar boom coincided with advancements in lithography that made color printing economically feasible for the first time. America’s 10,000 cigar manufacturers saw the new lithography as a way to make their wooden boxes more appealing, and soon colorful lithographs blossomed on the inside of every lid. The artwork had no connection to the cigars themselves but was there to boost sales, either through visual appeal or by depicting a subject or personality that the smoker would be inclined to identify with, like a popular president. A number of these boxes survived, and 160 of them make up the bulk of this book. The material is tidily arranged, with each cigar box given its own section and illustrated in a color photograph, making for a book that is rich in graphic appeal. The lithographs represent a wide variety and include famous personalities, places, and historic events as well as whimsical illustrations. Supplementary ephemera is added where appropriate, such as a period postcard showing early automobiles traveling along a famous roadway that’s depicted inside the box lid. Though some of the lithographs’ colors have faded or sustained edge damage, the photographs reproduce well and are large enough to show details. Beyond the eye candy, an equal amount of the book’s charm comes from the text that accompanies each entry. Detailed and accurate but never stuffy, the text tells the backstory of whatever is being celebrated on the box. The writing is done with a light, casual touch, and even text accompanying well-known figures manages to deliver some fresh facts. An even greater pleasure is discovering personalities who, though rightfully famous a century ago, have now slipped into oblivion. It’s fun to learn that the world’s most famous railway, the Orient Express, was built by a man almost no one remembers—Baron Hirsch, a German industrialist who, in his time, was Europe’s fifth richest man and the world’s most generous philanthropist. Tidbits like this keep pages turning and interest high. The book’s appeal isn’t limited to cigar enthusiasts or collectors of Americana but should score a hit with history buffs, trivia fans, and the eternally curious. A table of contents that lists each lithographed box by name and a detailed index at the back make the book easy to navigate. Vintage cigar ads decorate the index and carry the book’s theme to the very end, while back cover notes and a brief author’s biography accurately reflect the lively flavor of the book. 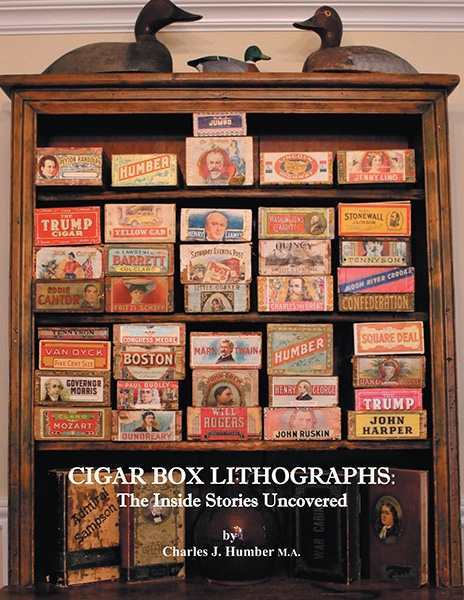 Fully illustrated and packed with interesting details that shed light on the vanished Gilded Age, Cigar Box Lithographs is a delight at every turn—even if one has never picked up a stogie.